Craft marketplace Etsy has acquired mobile photo app maker Mixel as part of its efforts to beef up native mobile app development. Mixel launched in November 2011 as a hyped collage creation app for the iPad, and later pivoted to be more of a simple photo manipulation tool for the iPhone. The four-person Mixel team, which had talked to a number of potential buyers after its pivot, gets to stay in New York, making the easy move to Etsy’s Brooklyn office from the Union Square area. Mixel co-founder and CEO Khoi Vinh — who was formerly design director for the New York Times’ Web site and is now Etsy product design director for mobile — said he and his co-founders are stripping out Mixel’s social networking features but leaving the core collage-making tools. They plan to maintain the product by working nights and weekends. Meanwhile, Etsy’s Mike Brittain, who is director of engineering for mobile, said the company has projected that mobile traffic will top desktop traffic by the end of 2014. Today, at least 25 percent of Etsy’s traffic comes from mobile. 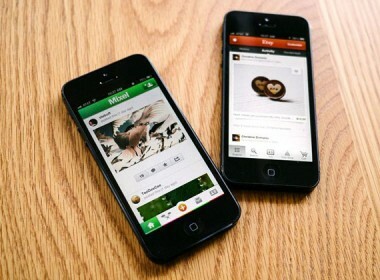 The company added iPad and Android apps to its iPhone and mobile web offerings in December. During the 2012 holiday season, mobile shoppers accounted for a third of visits. But Brittain said the majority of mobile traffic comes via the mobile Web, and the company feels it can offer a better experience with native apps. Asked whether the Mixel deal was actually an acquisition or simply a talent hire, Brittain said the company was fully acquired, but would not disclose further details. Vinh and Brittain attested that Mixel and Etsy aligned on a few different axes — not just location — as both companies are built by “makers” and provide highly visual products. Mixel had raised $1.1 million from Betaworks, Polaris, Allen & Company and CrunchFund.